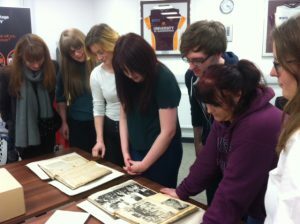 A team of students from our History department are in the searchroom today as part of their co-research into the Whitley Collection. A group of undergraduate and postgraduate students and academic staff at the University of Huddersfield have come together to curate an exhibition, write a conference paper, and to publish a chapter in a book. Paul Ward, professor of modern British history, explains why engaging students as researchers and using a co-production approach to interpreting the past will lead to a better historical understanding about relationships between Britain and its Empire in the early 1930s. The group are looking at JH Whitley, the MP for Halifax between 1900 and 1928 and Speaker of the House of Commons in the 1920s, whose papers are held in Heritage Quay. The project explores his attitudes to the British Empire. Whitley had a growing enthusiasm for the Empire Parliamentary Association as a vehicle for binding the British Empire more closely together through developing relationships between politicians from the dominions and Empire and those at the Palace of Westminster. •Look at Whitley’s statements on Empire as an MP. •Research biographies of the members of the Royal Commission, including the female and Indian members. •Map the Royal Commission’s travels across the Indian sub-continent. •Analyse the newspaper stories written and the photographs taken and collected in a series of scrapbooks. •Consider the members’ descriptions of their tour of India and the Report’s recommendations. 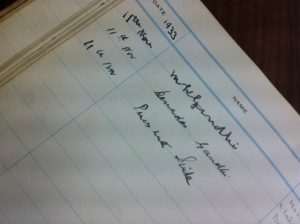 •Analyse Indian attitudes towards Whitley and the Commission, including the visit Gandhi made to him in 1933. •Use a variety of conceptual tools to think about our research and the meaning of the commission in the early 1930s, including orientalism, colonialism and postcolonialism and subaltern studies. •Examine relationships between Britain and India – and especially the locality of Halifax in Yorkshire – in the 1930s and the present. This is a good opportunity for students to undertake training for primary historical research, exhibition curation and academic writing and the students will receive full credit as curators and authors of the exhibition, conference paper and book chapter. But it is also an experiment to apply collaborative research to a range of historical sources, including the Commission’s 600-page report, Hansard, and the Whitley collection itself. Using a group of researchers will enable sustained collaborative discussion about the meaning of the documents because of the multiple perspectives that will be available. Already we have benefited from the interdisciplinary nature of the project team – we have students from textile practice and politics as well as history – and through taking an open-minded approach to historical interpretation, we hope to be able to explore the workings of the Royal Commission in a variety of ways. First encounters with the Whitley scrapbooks in Heritage Quay. Amy : I am fascinated by colonial India and keen to take part in research opportunities, so this project was a perfect fit for me. I am excited to be both involved in some original research and also to be working collaboratively, which is not something I have done before. I am eager to see what conclusions this project comes too and the way in which the different perspectives and opinions of all the people involved come together to shape the project. Also, I hope to go on to do a masters degree after graduating and so this is a great opportunity for me to gain skills and experience for that. Madeleine : I sought to be involved with the Whitley research project because I feel like it is an extraordinary opportunity. To explore primary documents that have yet to be analysed, research collaboratively with members of University staff and post-graduates, and to be involved in the creation of a published piece of work are all experiences that are both rare and incredibly valuable for undergraduates such as myself. Consequently, I believe this will be one of the most important learning experiences I will have at the University of Huddersfield and I look forward to what seeing what our research may discover. 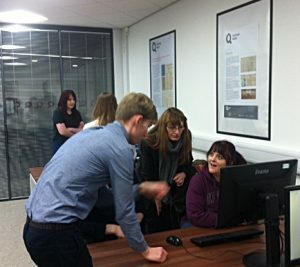 Rob Clegg, Heritage Quay’s collections access officer, talking to Whitley students about using archives. The radical historian Raphael Samuel wrote, ‘history is not the prerogative of the historian … It is, rather, a social form of knowledge; the work, in any given instance, of a thousand different hands.’ In this project, we want to foreground collaborative ways of working in order to understand the past and its implications for the society we inhabit today.